Shape and cut are often confused but know this: they aren’t the same thing. If you confuse the two, you may end up making an unfortunate purchase. I’m going to explain what the difference is in this article between diamond shape and diamond cut. Let’s start with shape. A diamond has to be cut to create its shape. 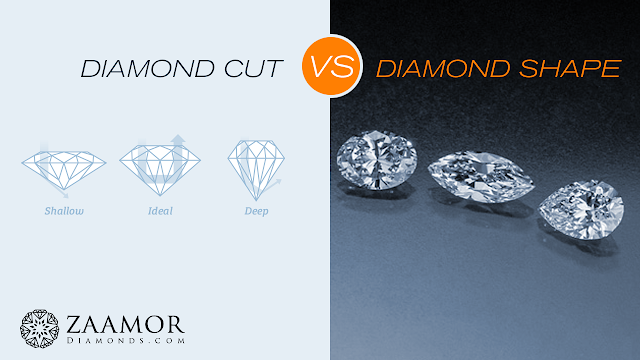 But what’s referred to as the diamond’s cut isn’t the same as its shape. Shape refers to the basic external outline of a gemstone. 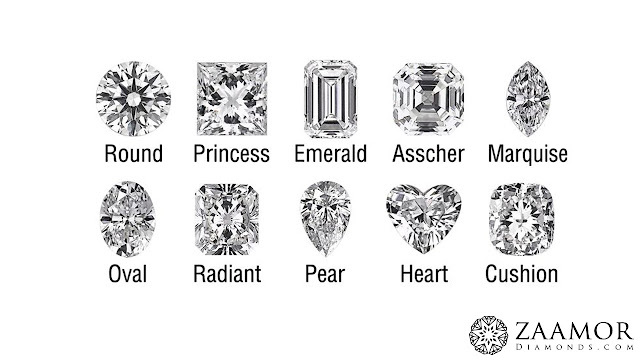 Round, oval, square, triangular, heart, marquise, and pear are all shapes. And they all describe shapes of diamonds you might be looking for. Soccer balls and basketballs are the same shape and can even be the same color. But are they the same? Not by a long shot. Any kid can tell the difference between the two. It may take a trained professional to recognize the differences between two round diamonds, but you’ll always be able to identify its shape. Round is round! Identically shaped stones can be cut, faceted differently. A round stone can be cut with any number of facets and dimensions—and still be round! Where Diamond Naming Can Get Confusing? 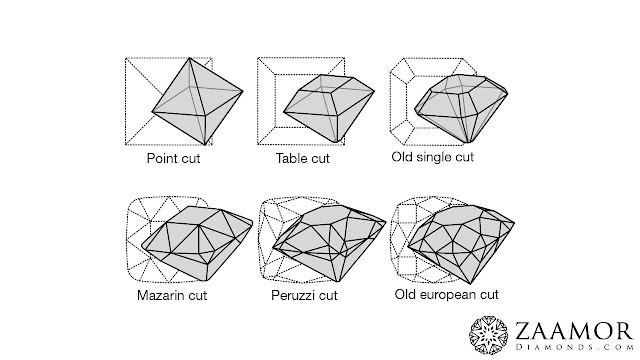 One of the confusions you’ll run into is that some diamond shape names have had the suffix “cut” appended to them. For example an “emerald cut” diamond refers to the stone’s square or rectangular shape and the way it’s normally cut. An emerald cut is unique in that the corners are notched making it easier to set and making its corners stronger. In the jewelry industry if someone says to me, “I have an ‘emerald cut square’ diamond to show you.” I know that it is square in shape and has the unique notched corners of an emerald cut. And it has the unique step cut that sets an emerald cut apart from one of the other cuts I write more about below. 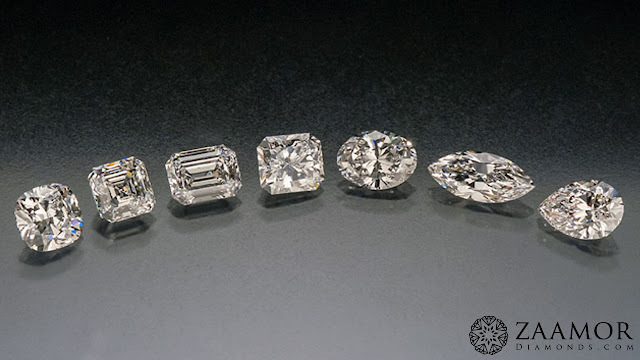 Sometimes both the shape and the cut are used in the diamond shape name to identify a single stone. A “round brilliant” diamond has a round shape and a brilliant cut. So maybe you’ve picked a diamond shape and you think you’re done. But more than anything else, the cut determines the diamond’s overall beauty and dazzle in three really important ways: proportion, symmetry and polish. How these three factors interact with and against each other affect the way light moves within the diamond. It’s like the sun hitting a mirror and reflecting onto another wall, except there are numerous little reflective surfaces and facets bouncing the light all over the inside of the diamond. In a well-cut diamond, light enters through the top, or table, and reflects off the angles between the flat places (the facets) on the sides (known as the crown and the pavilion) and exits back out the top. The brightness created by a combination of the white light reflections on and in the diamond. The flashes of color you see within the diamond. Taken altogether, these are the reasons a beautiful diamond catches your eyes and why it seems to glow from within. That dazzle is created by the light reflecting and refracting off the angles and the flat surfaces between (the facets). In a badly cut diamond, the light goes on the top, leaks out through the sides and ends up looking dull. It may even be a bigger diamond by weight (and thus be more expensive), because not enough of the material was cut away to give you the sparkle everyone looks for — and marvels at — in a diamond. A square or slightly rectangular cut — which you might hear referred to as a princess-cut diamond — is the next most popular choice for an engagement ring. This is known as a mixed cut or a modified brilliant cut, and can also have the fire and sparkle of its round brilliant cousin. Fancy shapes can also be cut to enhance a stone’s sparkle and dazzle, including the pear, marquise, cushion and heart. So there you have it. Pick a shape you love, and then look at several diamonds to see how the light plays within them. Don’t get too caught up with the carat size (its weight) even though that’s often the first question other people will ask. The cut is what determines how dazzling your diamond engagement ring will be, forever.